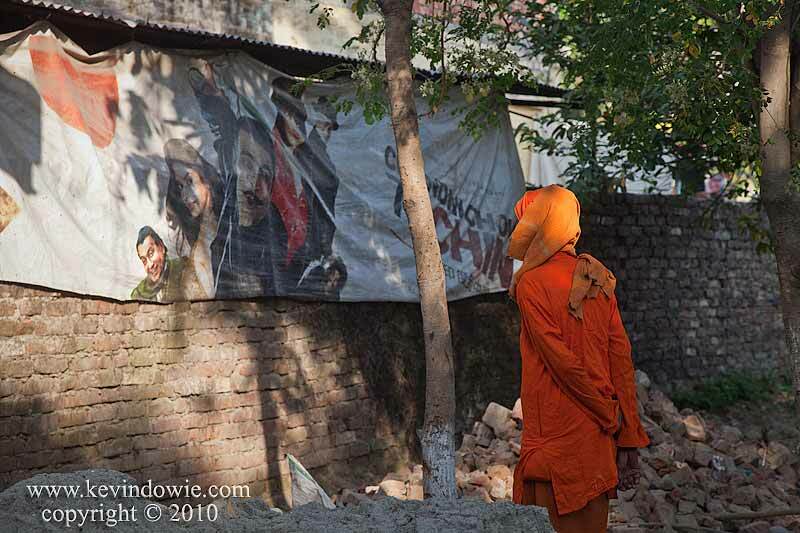 Man looking at poster, Haridwar. One of the things I like to try and capture in photographs is juxtaposition, an unlikely or quirky combination of elements. That was what sprang to my mind when I noticed this man looking at a poster in Haridwar. This scene presented itself on the edge of a temporary, tented community in Haridwar. Millions of people had converged on the town for the Kumbh Mela festival, some of those people having travelled for several days to get there. Entire villages of people travelling together had set up such encampments in and around the town and we were made welcome. In this instance, I liked the relationship between the man, rather anonymous in his orange clothes with his head covered, looking at the poster with the dashing, moustachioed, bollywood type character, seemingly looking back at him. It’s not a great picture by any means and ideally there are things I would rather were different, I’d prefer that the tree wasn’t there, that the sand heap in the foreground wasn’t there etc. However, I’ll display the image simply because the unlikely connection between the characters appeals to me. Canon 5D Mark 2 with 24-105mm zoom at 90mm F6.3, shutter speed 1/800 second at ISO 1600.